How does a musician career start? You first think of a song, write lyrics and music. You find fellow musicians, then practice a lot and eventually, you go to a studio to record your first tune. And what next? Next, you upload it to SoundCloud. Why you do this? Because it's the biggest unique music database where musician, songwriters, and producers are sharing their work, trying to find inspiration, collaborate and create something new. If God were a musician, he'd start with SoundCloud. Because he'd know that SoundCloud is where Post Malone, Kygo, and many other artists started. And now they are touring all over the world and still keep uploading their music to the service. Because of its popularity, SoundCloud has become an open music source with lots of people trying to convert SoundCloud music to MP3 to later listen to it offline. This is somehow illogical since SoundCloud has a great app allowing you to stream from the service, add to favorites and all that. However, it does become a problem when you want to make a playlist consisting of your local tracks combined with the ones from SoundCloud. There are a few ways how to convert SoundCloud to MP3, and I'm going to tell you about them. I suggest you skip the first part, anв go to the second one right away. You've been warned. This option involves using different tools for different steps. As you probably know, lots of tracks on SoundCloud are free for download. To check it, click on «…» and there must be a Download button. 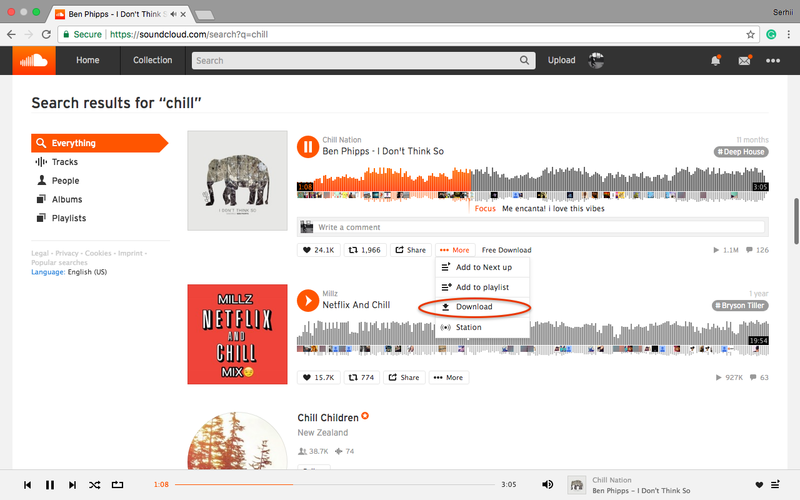 Most tracks on SoundCloud are in WAV format, so now that you've downloaded a song, you need to convert it. I'm not going to tell you how to do it, you'll figure it out yourself. Only then can you upload tracks to your iPhone. Why converting SoundCloud to MP3 is a terrible thing to do. As I've mentioned before, thousands of musicians use the platform to share their music with the world, and they usually buy Pro accounts to be able to upload music in Hi-Res. VOX is an audio﻿ player for Hi-Res music, so if there's a Hi-Res track on SoundCloud, you will hear it in the best quality. However, when you convert SoundCloud to MP3 you basically destroy all their work squeezing all the beauty out of their tracks. In the end, there's a low-quality parody of the original track. To make it simple, I suggest you use VOX Music Player for Mac & iPhone. A few words about VOX. It's an audio player initially designed for audiophiles and music lovers that can play most audio formats both lossy and lossless, includes 30,000 radio stations and has an unlimited cloud storage. However, what interests us today, is that VOX features a separate SoundCloud streamer with Charts, Stream, Likes and Search. To turn SoundCloud to MP3, start VOX, log into SoundCloud in the VOX app for Mac or iPhone and start streaming the immense music collection. You won't ever need to google "how to convert soundcloud3 to mp3" and use some uncertified tools. The best thing is that you can now combine MP3 from SoundCloud with your local library to create unique playlists. It's a great option since you no longer need to switch between music apps. All your music is in VOX Music Player.